October Update: New Podcast, Articles, & More!!! Now the autumnal shift is fully present and unavoidable as the trees show their gorgeous display of fall colors and days get cooler. However this is still a busy time of year…even with some 75% of the fruit crops wiped out there is still a bit to harvest. Before we take a look at that, I’d like to announce the addition of two new pieces to the Articles page, one titled Making Ink From Berries by guest writer Dana Driscoll, and the other a small-scale alley crop photo essay by yours truly. 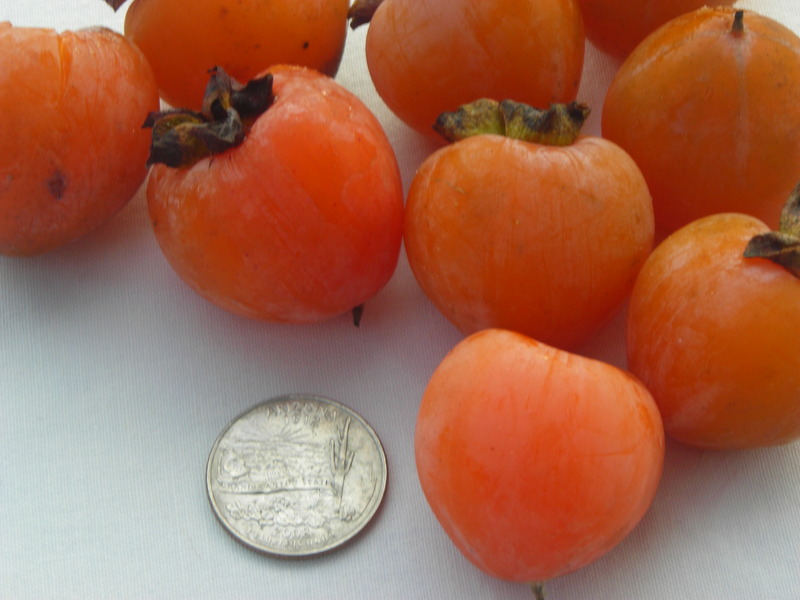 Speaking of new content, I am also excited to share with you my latest audio podcast with the American persimmon fanatic, Jerry Lehman! Click here to listen to the podcast and stay tuned for Episode 3 with Michael Phillips, the author of The Holistic Orchard. 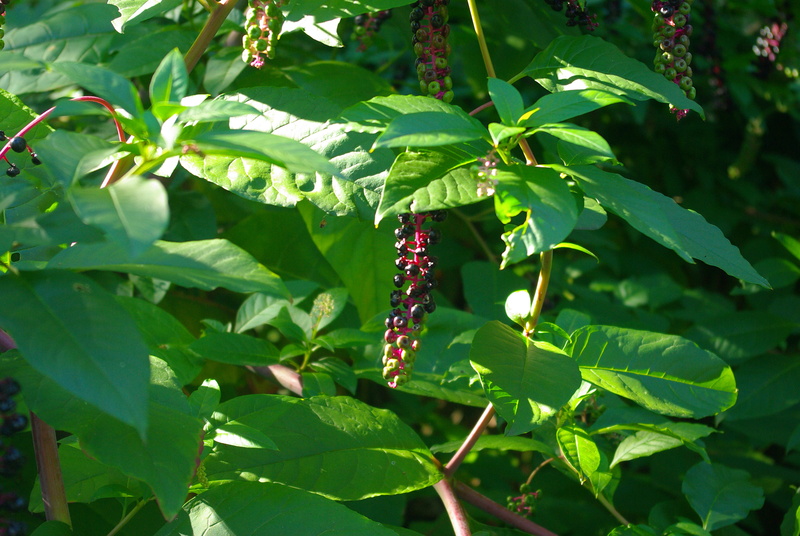 In a new article Dana Driscoll teaches us how to make natural ink from pokeberries and other berries. Alley crop just the other day…nice shadows from the nanking cherries. Click here for more. CLICK HERE to learn more about this project! 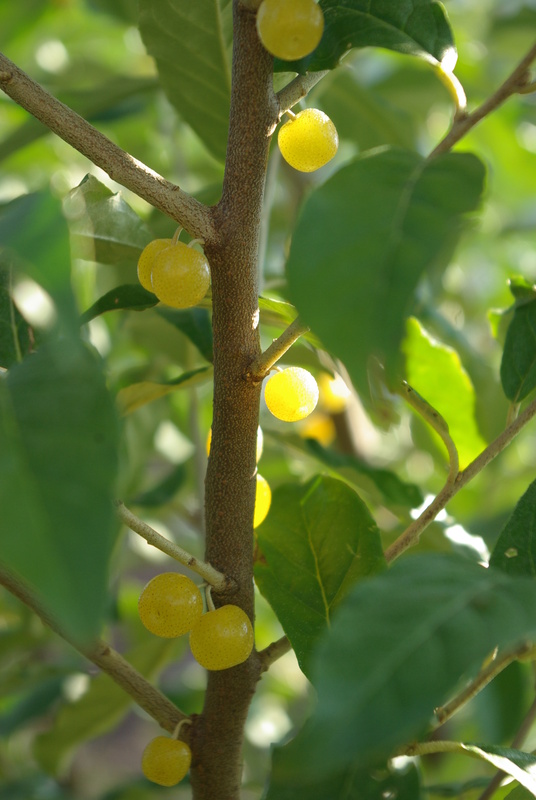 ‘Amber’ is an autumnberry cultivar that produces yellow fruit…yum! 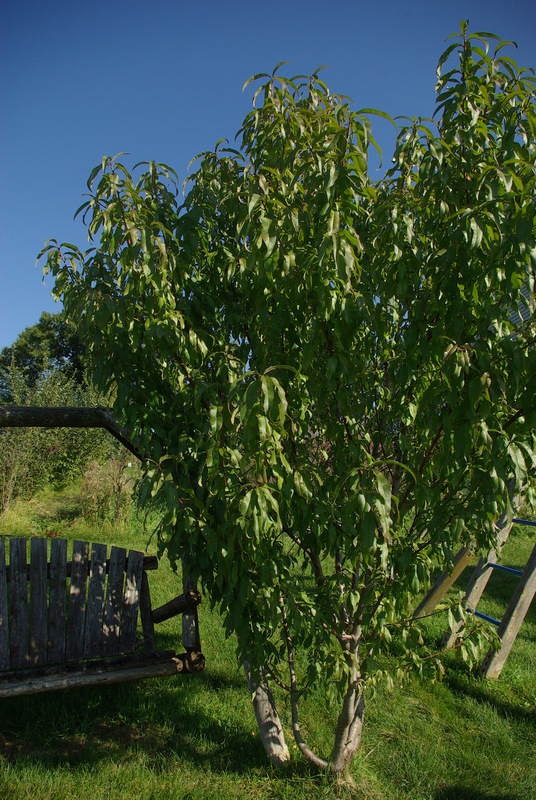 This multi-stemmed ‘Q-18’ peach provides nice shade when sitting on the bench. 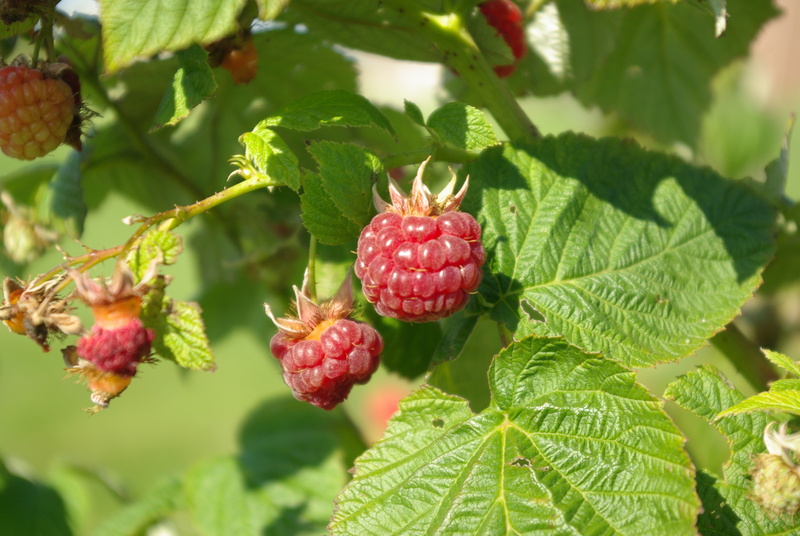 Fall-bearing red raspberry…not sure which cultivar. 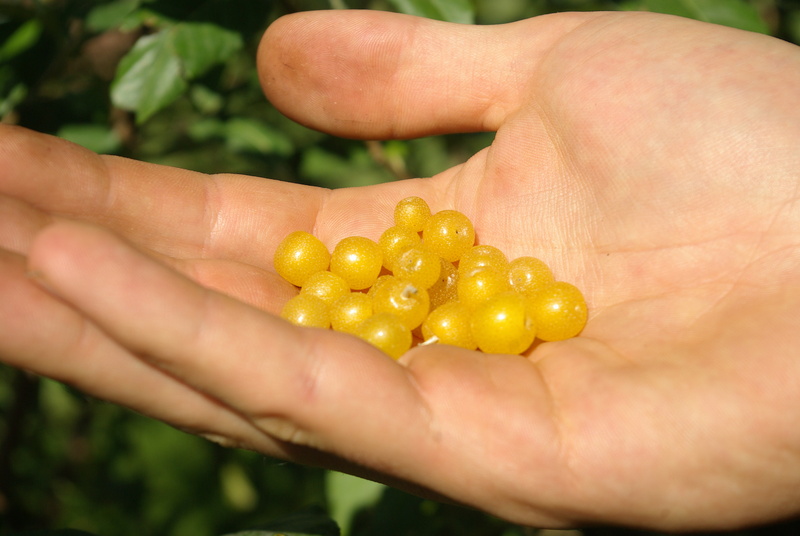 Autumnberry is a truly abundant wild food that is loaded with nutrients and so widely available. More people need to start harvesting it. There is a big debate with autumnberry and many other plant species— some folks believe eradication is necessary because these plants are “invasive”, which is an entirely non-scientific claim that lacks any ecological footing. This is a big issue and we won’t get into it too much right now, but I would like to point out one thing. In the case for autumnberry, the plant arrived to NA back in the 70’s and was promoted largely by the USDA and conservation districts, NOW the same folks who encouraged the planting and dissemination of autumnberry are the ones promoting its eradication…SO, to me it seems only rational to NOT put full trust in these organizations and institutions. Who knows what will happen 30 years from now if herbicide applications are continued in radical attempts to eradicate opportunistic plants? All I am saying is we need to be incredibly mindful when we intervene on this level and have great forethought into potential future outcomes…good or bad. That concludes my rant for now. 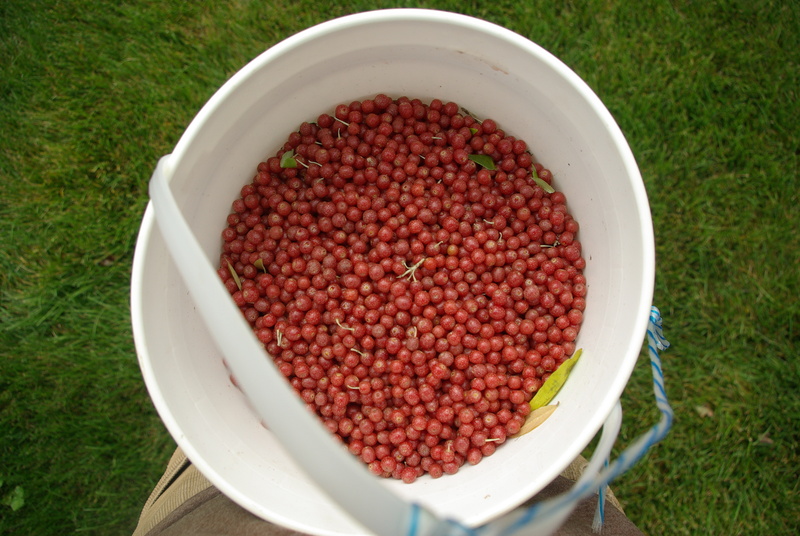 Harvesting lycopene-rich autumnberries…which I later made into tasty jam. 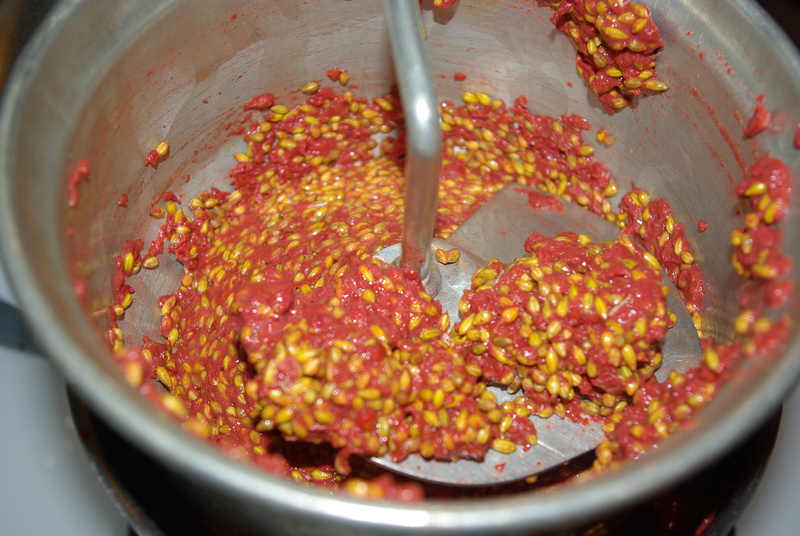 As the autumnberries cook down they turn a beautiful reddish-pink color. The berries are much more attractive to the eyes then the taste buds. enough to experiment making a small batch of jam. If you’ve ever tried mountain ash berries then you know they’re incredibly astringent and barely palatable(there are some varieties and hybrids which are better for eating). 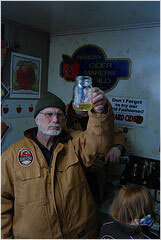 In past years I’ve made mountain ash mead and used the tree as a rootstock for shipova(more to come on that soon). But I never really ‘ate’ the berries. 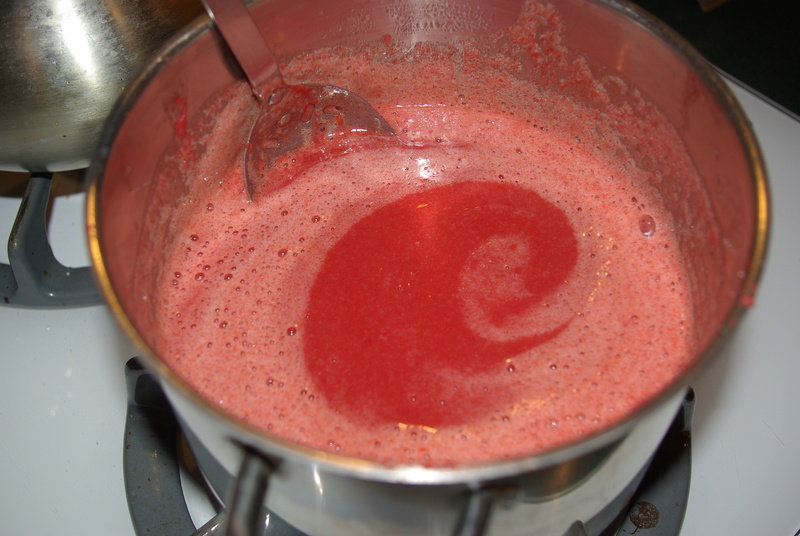 So I tried making a batch of jam…and…it tastes awful. No matter how much sugar you add the astringency just intensifies. Supposedly the berries get sweeter with a frost… and they are said to be high in vitamin C. I think its more useful as medicine then food. 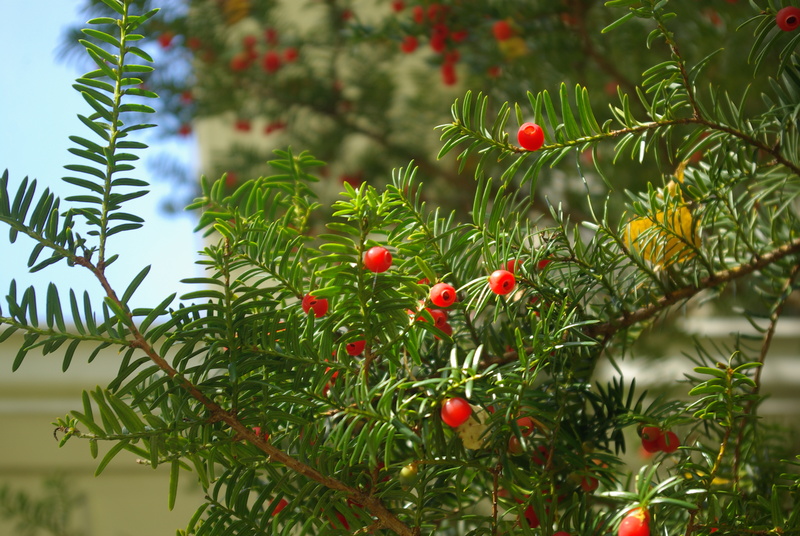 Another not-so-edible berry…is the yew berry. 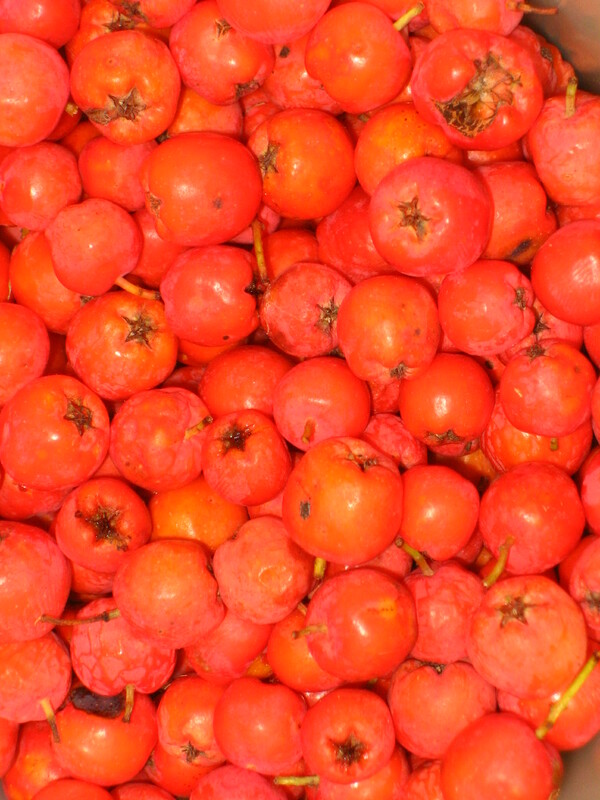 Which in fact contains a highly poisonous seed…but the red jelly-like flesh is said to be edible. And it is edible, I am living proof. Out of curiosity I began nibbling on the berries this fall and I found they’re actually quite good! Very sweet with a mild flavor. The texture is slimy. An interesting relative that I’ve only read about is Japanese plum yew(Cephalotaxus harringtonia); this one is said to produce larger fruits that are fully edible, seed and all. Yew berries are ornamental and delicious…just be very careful not to eat the seed, or the ‘pip’ as the brits say. 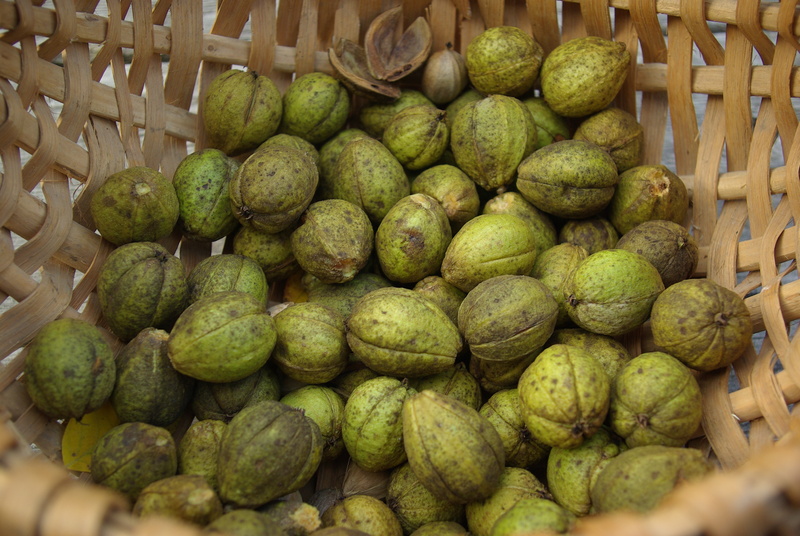 Hickory nuts in husk…good luck getting ’em before the squirrels! 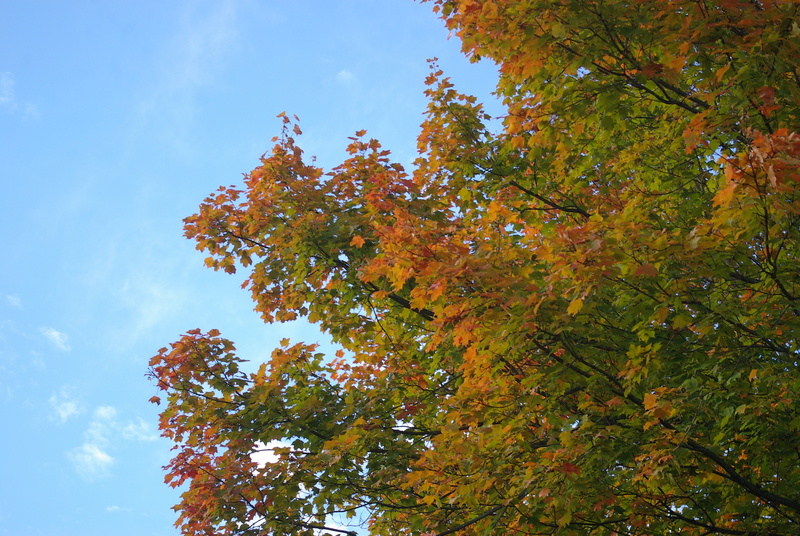 Gorgeous fall colors…embrace the beauty! 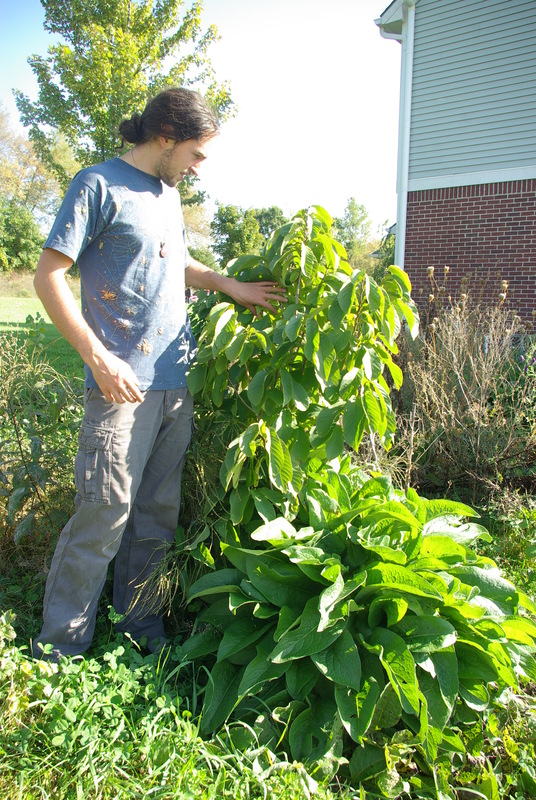 Eric Toensmeier is the author of Perennial Vegetables and the co author of Edible Forest Gardens Volumes 1/2. He has a wealth of knowledge when it comes to food forestry, permaculture design, and useful plants. What follows is an essay Eric recently wrote about the nitrogen fixing capacities of a variety of plants from different regions. This one’s especially good for the plant geek within you! Learn more by visiting Eric’s website www.perennialsolutions.org. 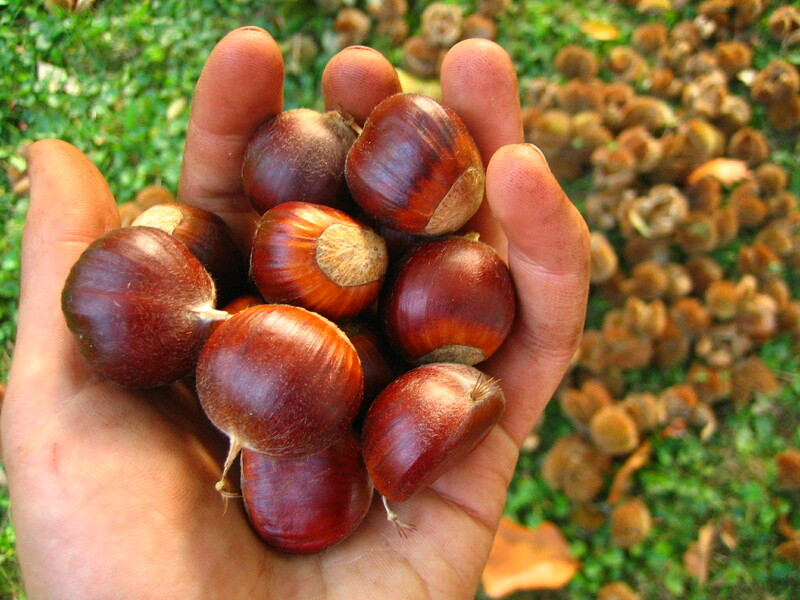 Nitrogen fixing species are a cornerstone of food forestry and other permaculture practices. Through a partnership with symbiotic organisms in their roots, these plants can turn atmospheric nitrogen into nitrogen fertilizers useful to themselves but also becoming available to their neighbors over time through root die back, leaf fall, and chop and drop coppice management. 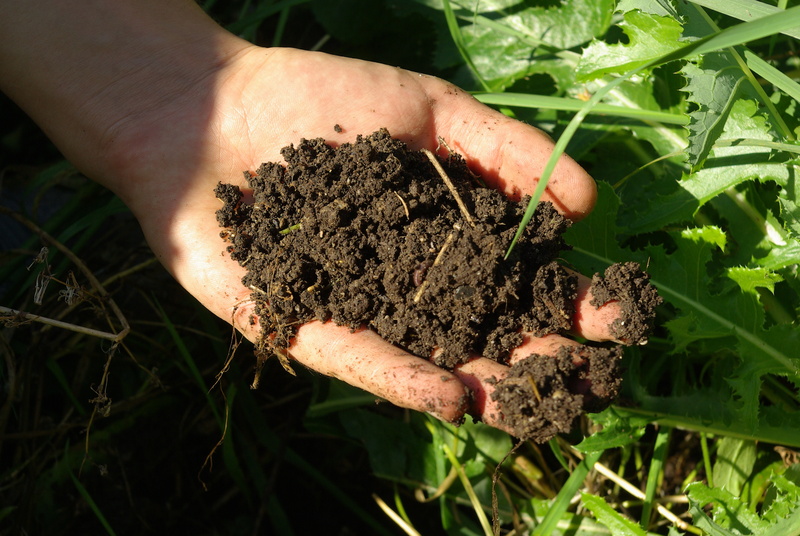 While it does not replace the need to bring in phosphorus, calcium, and other nutrients depleted by harvests, this strategy provides a free source of an essential fertilizer. 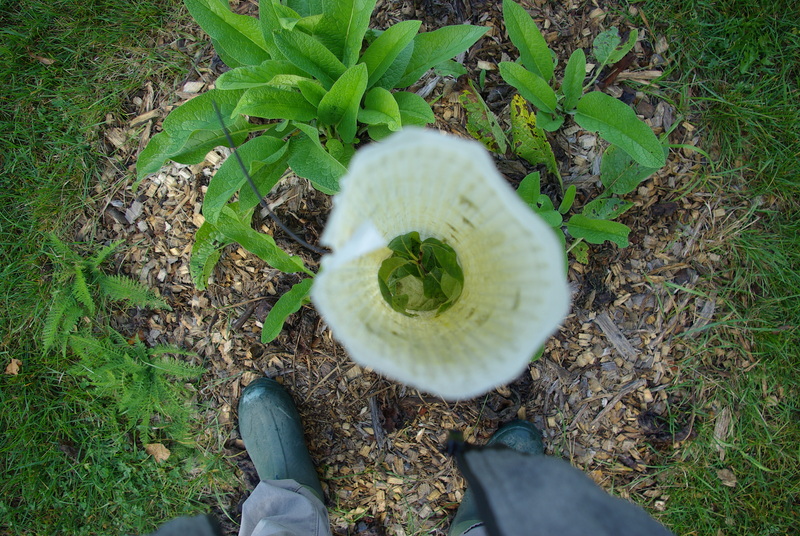 Martin Crawford’s Creating a Forest Garden and Nitrogen Fixing Plants for Temperate Climates are excellent resources for calculating the percentage of nitrogen fixtures needed in order to supply all required nitrogen just from plants. 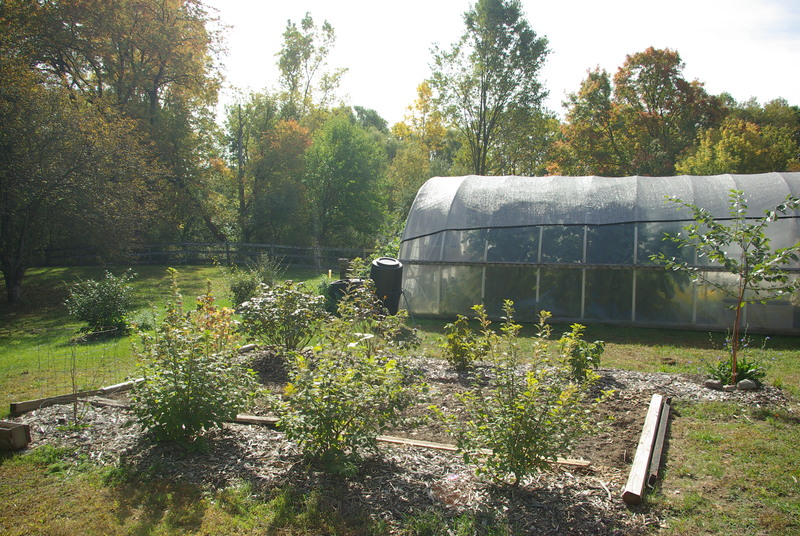 Martin estimates this at 25 to 40% of plants in full sun or 50 to 80% of plants and shade, depending on the nitrogen needs of the crops being grown. Now I’m going to throw another wrench into your calculations. 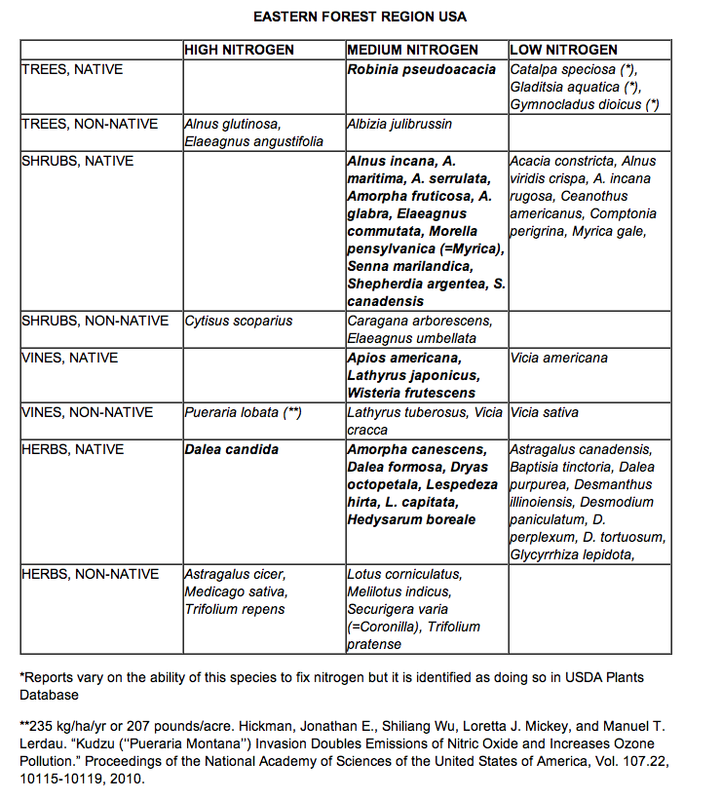 I’ve known for some time that the amount of nitrogen fixed varies widely among species, but I recently discovered that the USDA plants database gives information about the amount fixed about many, many species native and naturalized to the United States. Check out their advanced search page to select species for your area. They classify species as HIGH (160+ lbs/acre), MEDIUM (85-160lbs/acre), and LOW (1-85lbs/acre). Note that there are a few species that might represent data entry errors. For example Phragmites is listed as a nitrogen fixer, though I’ve been unable to find another reference to this being the case. It’s interesting to note that many of the most hated naturalized species turn out to be incredibly efficient nitrogen fixers. 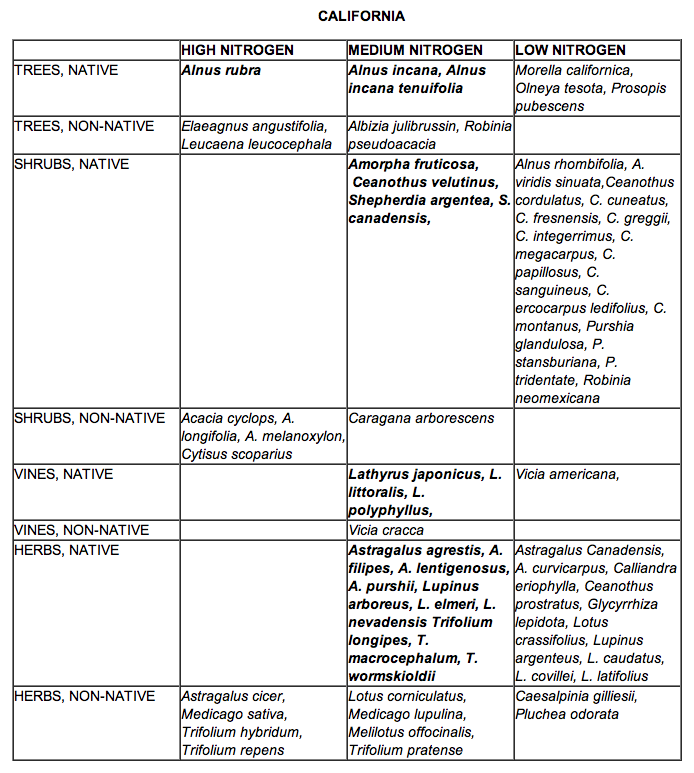 In fact the “high” nitrogen fixtures category is a rogues gallery of successful dispersive species, like Russian olive (Eleagnus angustifolia), kudzu (Pueraria lobata), and Scotch broom (Cytisus scoparius). I decided to use the database to generate lists of native and non-native nitrogen fixers and categorize them by their efficiency. 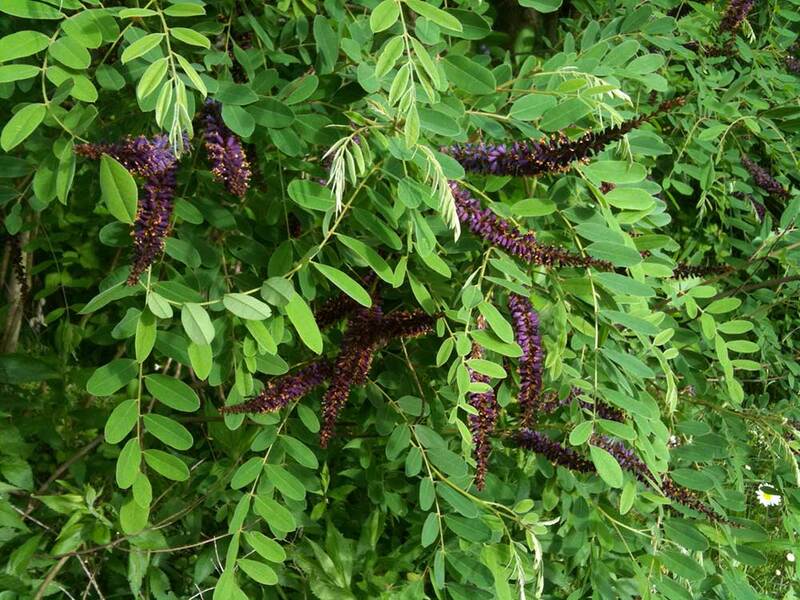 In many cases there’s a strong temptation to use nitrogen fixing species which are also edible. I’d like to point out that if you harvest a heavy crop from a nitrogen fixer, you’ve probably taken most of the nitrogen with you, though this may not be the case with fruits as much as it is with beans and leaves. 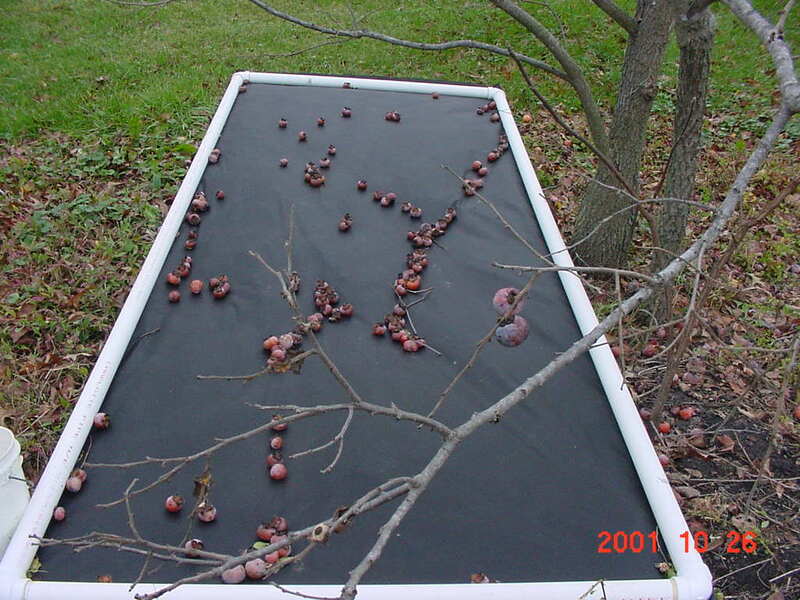 This is another good reason to use efficient native nitrogen fixers even if they’re not edible. On the other hand, if what you really need is nitrogen there are very few native species in the “high” category, making a good case for use of white clover and other non-natives.Though not all native plant enthusiasts would believe it, I’ve spent decades promoting underutilized native plants. 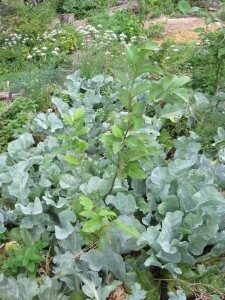 While you may choose to grow non-native pears and peaches in your food forest, there is no particular reason to grow a non-native nitrogen fixer over a native one, with all things being equal. In fact I tend to assume that native plants have a network of visible and invisible relationships with other organisms of all kingdoms, making them more desirable to use whenever possible. I think with the information these databases have provided, we are in an excellent position to promote particular native nitrogen fixers for use in permaculture projects. With that said, let’s look at a few tables I put together for different regions of the country and then review some of our top native candidates. The astute reader will note that there are very, very few natives in the “high” category. I would speculate that there may be few anywhere, but that they are spreading around very, very successfully. 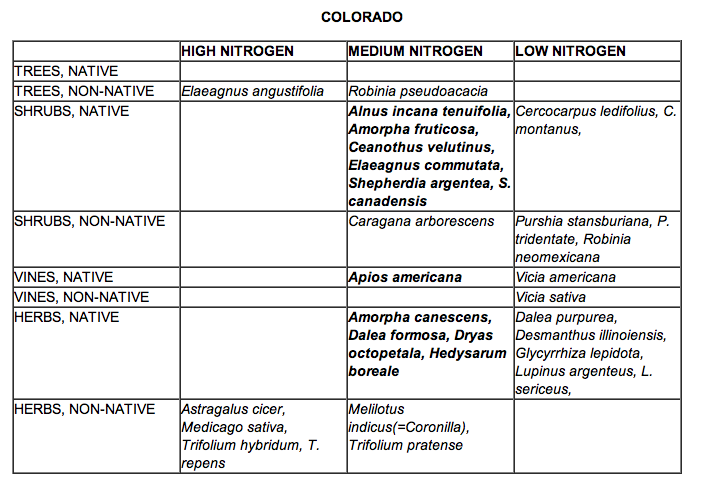 I’d like to profile a few of these US native nitrogen fixers that have broad range of applicability. Red Alder (Alnus rubra) grows throughout much of Western North America, particularly near the coast. It coppices readily, at least if you start when it is young and do it frequently. Unlike most alders it does not require wet feet. It can also handle some partial shade. Here in my garden in Massachusetts is killed the ground during winter and re-sprouts up to 10 feet high the following year. According to the database, this is the only tree native to North America that fixes over 160 pounds of nitrogen per acre per year. Though you might think that other alders are equally powerful, the genus actually shows up in the high, medium, and low categories. White Prairie Clover (Dalea candida) is a native clover of the prairies that extends some into the Eastern Forest region. It is used to make a tea, but had never crossed my mind as a particularly significantly given at all of the hundreds of species that seemed to grow in the prairie. Now I know that the USDA database states that this is the only herb native to North America that fixes over 160 pounds of nitrogen per acre per year. Though it wants full sun and (and can handle fairly dry soils), I’m going to try to find room for some of this little–used native that is deserving of a place in the spotlight. Interestingly, like alder, members of this genus can be found in the high, medium and low categories. 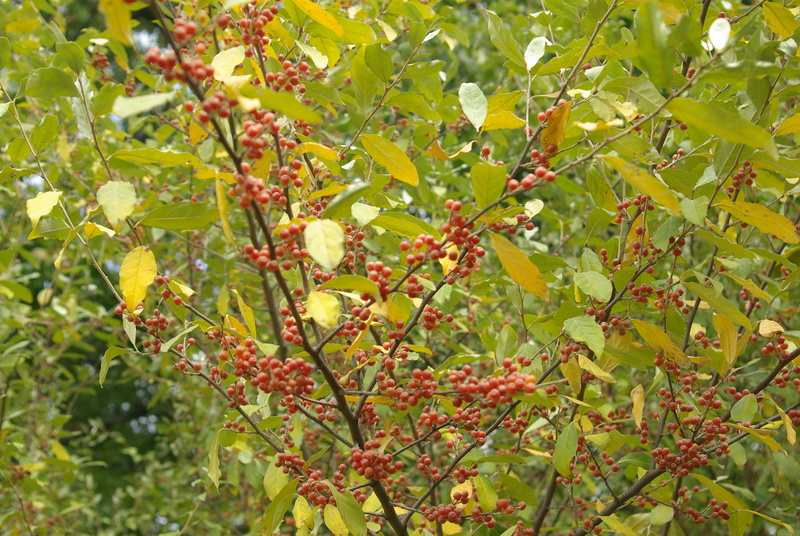 Buffalo Berry (Shepherdia argentea) it is native from New York through California. It is fairly drought tolerant and suckers extensively. 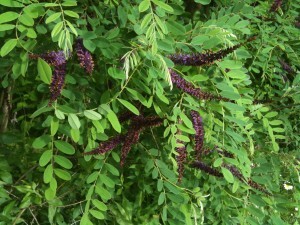 It can produce very high volumes of edible fruit, though you need both male and female plants to get it. It can coppice, though again Jerome Osentowski reports that at his site it does not do so reliably. USDA rates this as a “medium” nitrogen fixer. The related S. canadensis and Elaeagus commutataare also “medium” N-fixers and widely native. I’d love to hear about your experiments using the database (or this article) to select native nitrogen fixers for your area. Myself, I feel like I have a new tool to make sure that the nitrogen fixers I select will be the best available for the job. 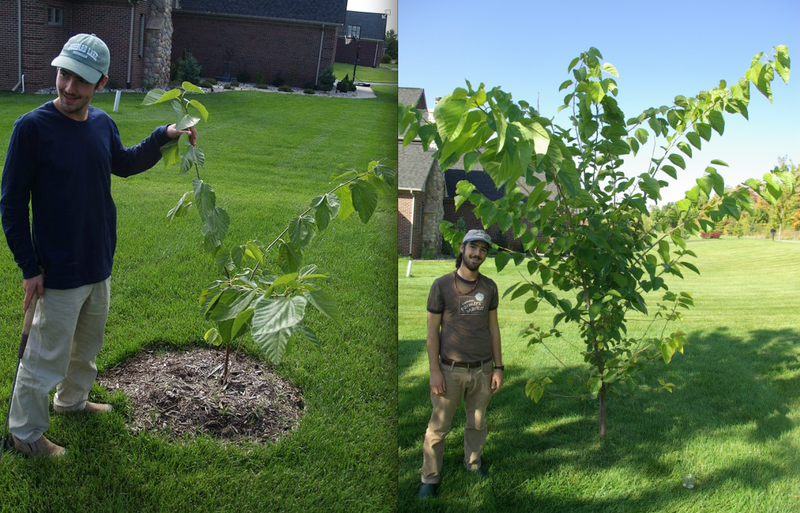 I also feel like I can make a strong case for growing some native species that are currently very underutilized.